Coaches Blake Shelton, Adam Levine, Jennifer Hudson and Kelly Clarkson were each shown pitting two members of his or her team against each other at a time for the final Battles of the season. By the end of any given duet, only one person could remain in the competition -- unless an opposing coach opted to "steal" the losing artist. The artists who won their Battles were Sarah Grace, a 15-year-old from Houston, TX; Kameron Marlowe, a 21-year-old from Kannapolis, NC; DeAndre Nico, a 22-year-old from Port Arthur, TX; Claire DeJean, a 17-year-old from Dallas, TX; Kirk Jay, a 22-year-old from Bay Minette, AL; and Kennedy Holmes, a 13-year-old from St. Louis, MO. And the artist who was stolen by another coach after losing his Battle on Tuesday night was Funsho, a 28-year-old from Lagos, Nigeria. The first Battle on behalf of Kelly's team was between Sarah and Erika Zade, a 20-year-old from Miami, FL. The girls were mentored by singer Thomas Rhett. Sarah and Erika performed "No Roots" by Alice Merton, and Adam noted Sarah had a cute "sass face." She also did the "heavylifting" with the high notes. Blake appreciated Erika's softer voice that has skill and control, but he would pick Sarah as the winner since her voice has "attack," as if she's "a little bit mad at the song." Jennifer loved the energy of the performance, saying Erika had "swag" but both of their "superpowers" were showcased. But the decision ultimately came down to Kelly, who acknowledged they both had different approaches for the performance. Kelly explained Erika was "intense" and "rad" with effortless runs, while Sarah is a huge talent at age 15. In the end, Kelly named Sarah the winner of the Battle, and Sarah cried tears of joy and relief. At this point in the season, Blake was the only coach with a steal left, but he was waiting for an artist with an "undeniable" voice he simply needed to have on his team. Next up was Kameron who was paired up with Kayley Hill, a 29-year-old from Nashville, TN, for a Battle on "Team Blake," for which Keith Urban served as the advisor. The duo took the stage with an interesting rendition of "I Only Wanna Be With You" by Hootie and the Blowfish. Jennifer said Kameron seemed "so comfortable," while Kayley had her vocals down. Jennifer, however, would pick Kameron as the winner. Kelly explained Kameron has a big, powerful, beautiful voice, but Kayley sounds totally unique. She thought the performance was authentic to country music, but with that being said, she'd pick Kayley as the winner. Adam, however, thought Kameron was more "free" and better immersed himself in the Battle round, so the coach would go with Kameron. Blake then revealed his decision, that Kameron had won the creative Battle because of his current country sound. Blake also looked forward to pushing Kameron harder. A montage of Battles was then featured. For "Team Kelly," Claire performed "All This Love" against Josh Davis, a 20-year-old personal trainer from Cleveland, TN. Kelly declared Claire had won the Battle because she has a "beautiful, angelic softness" to her voice. Representing "Team Blake," Kirk and Caeland Garner, a 31-year-old from Coleridge, NC, were asked to sing a duet of "Let It Rain" for their Battle. Blake picked Kirk as champion just "based on a gut feeling." And on behalf of Jennifer's team, which is mentored by Halsey, the following two artists Battled it out for one spot on her team going forward: Kennedy and Lela, a 15-year-old from Miami, FL, with a performance of "Battlefield." Jennifer chose Kennedy as the winner because she's "more ready" for the competition that is The Voice. And the final Battle of the season belonged to "Team Adam" members DeAndre and Funsho, who were mentored by Cee Lo Green. The talented guys were asked to sing "Can You Stand the Rain" by New Edition and received a standing ovation from all four coaches. "That's what I'm talking about!" Adam yelled. 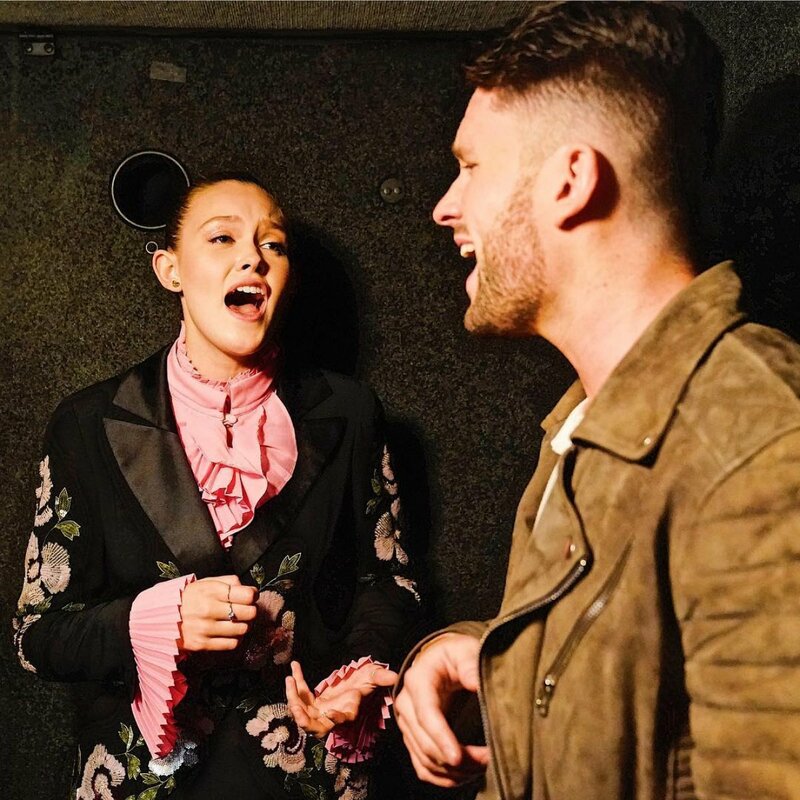 "That's what we hope for in these Battle rounds -- two incredible vocalists making good music but also laying it out on the line at the same time," Blake said. "You went toe-to-toe." Blake said DeAndre "took it to the next level," and Jennifer added that he "sang the hell out of the song." Jennifer noted, however, Funsho sounded like a member of New Edition. Kelly noted it was going to be a very difficult decision for Adam but she'd probably go with DeAndre. Adam then had to reveal his final decision. He said there wasn't a fair way to judge the Battle, but the winner was DeAndre because he has an "intangible" quality as an artist. But Funsho wasn't going anywhere, as Blake opted to steal him for his own team. Blake said it was a "bonehead move" for Adam to have paired up the men to begin with and Funsho absolutely deserves a spot on the show going forward. The Voice will begin its "Knockout Round" next week on NBC with iconic singer Mariah Carey serving as the contestants' key advisor.